The world of dentistry is constantly evolving. Dentists are always looking to improve their methods and the technology that helps them keep their patients in good health. We’ve truly come a long way over the past few decades in terms of technological advances in dentistry. Laser dentistry is probably one of the most exciting and innovative types of dental care to come to prominence in recent years. It’s a minimally invasive dental option that offers a great way to remedy some of the more serious dental health issues that someone can experience. If you are looking for the best laser dentistry in Stamford, CT, Periodontics & Implant Dentistry Center, LLC is the way to go. We offer laser dentistry services and other dental services to keep your mouth feeling healthy and fresh. Below, we will discuss the benefits of laser dentistry and the basics of how it works. Laser dentistry essentially involves dental professionals using extremely focused beams of light to remove or change tissue in small amounts. Lasers can be used for many different types of surgery. Dentists will typically use lasers to handle procedures on the inside of the mouth. Dental procedures like reshaping gums, whitening teeth, and removing excess dental tissue are all common uses for laser dentistry. 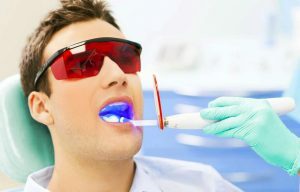 Additionally, issues related to gum disease can be treated using laser dentistry. If you think you might be dealing with early symptoms of gum disease in Stamford, CT, it’s a great idea to reach out to Periodontics & Implant Dentistry Center, LLC today. Some of the main ailments that laser dentistry can help out with are root canal infections, gum inflammation, and gum reshaping. Additionally, cold sore pain or canker sore pain can be helped by using laser dentistry. Biopsies can also be performed with laser dentistry. Even removing tissue from the throat that can cause sleep apnea is an option. There are tons of applicable uses for laser dentistry, with the list of uses expanding on an annual basis. If you are seeking a periodontist in Fairfield County, CT, who offers laser dentistry services, look no further than Periodontics & Implant Dentistry Center, LLC. The main benefits of laser dentistry are quite intriguing. With laser dentistry, you typically don’t need to use anesthesia. Infections are much less likely when you use lasers to handle dental procedures because lasers actually will sterilize gums. Patients also don’t lose as much blood when using lasers to handle dental procedures. Sutures are often not required when using laser dentistry. These are all strong benefits to keep in mind when you are deciding on potential dental procedures.